Dr. Sal gives reference links on fitness, stretching and nutrition for golfers. Hello, my name is Salvador, but most people call me Doc Sal. I am here to give you some fitness references where you can learn about flexibility and the important part it plays in any sport, but particularly golf. First, I want to say that the story about the forked needle is true. I have scared the pajeebies out of many kids over the years with that darned needle. I can still see the look of terror on Scruffy's face... it was priceless! I am semi-retired now and spend a great deal of time at the club working on my own fitness and trying to improve my golf game. I have noticed that I am not as flexible as I used to be and it occurred to me that perhaps many of you may be facing the same realization. So I told Scruffy that I would give you some links on fitness, flexibility and nutrition as they relate to golf. 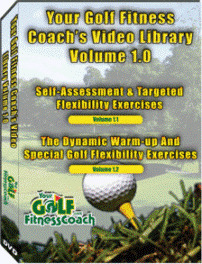 To make an impact on your golf game, you need a personal Golf Fitness Coach. Everyone has questions about the most effective methods to improve their golf game. I want you to meet my friend Bill Hartman, a physical therapist and expert on becoming physically prepared for golf. 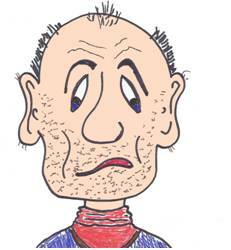 I recommend a visit to Bill's personal fitness blog to read his ideas on doing just that. Click below to get started. Do You Have Flex Appeal? No matter what your age or your level of physical fitness, if you play golf, flexibility is a key element. A site I would recommend is from the Kinesiology and Health Department at Georgia State University, that offers easy to understand and perform fitness exercises that will enhance your flexibility while providing anti-aging benefits. "As you age, your muscles tighten and range of motion in a joint can be minimized. This can put a halt to active lifestyles and even hinder day- to- day, normal motions. A regular stretching program can help lengthen your muscles and restore youthful activity." A simple adjustment toward fitness can be realized while enjoying your game of golf. Try carrying or pushing your golf bag as you walk the course, rather than riding in a golf cart. As a doctor, I am used to hearing complaints from people about their health and golf game. One day I was playing in a foursome with three senior golfers who hit the course with fading enthusiasm for the sport. "These hills are getting steeper as the years go by," one complained. "These fairways seem to be getting longer too," said one of the others. "The sand traps seem to be bigger than I remember," said the third senior. After hearing enough from these complaining cronies, I couldn't help myself from saying, "Just be thankful you're still on the right side of the grass!" When it comes to nutrition, one has to think of "The Shark", Greg Norman, who has maintained an impressive physique through the years. He explains, "foods that have been around for a long time remain on menus, but many more choices are available for people who want to eat healthier fare. Fried chicken is countered by low-fat chicken salad, and ice cream sundaes have a counterpart in frozen yogurt. While athletes in many sports have been advised to eat more nutritious meals for better sports performance, golfers have generally paid little attention to dietary factors. Perhaps because golf is a slow-moving activity that does not tax the aerobic or anaerobic energy systems, the advantages of healthy eating habits have not been appreciated fully." "On the other hand, traditional postgame 19th-hole indulgences were responsible for many players leaving the golf course in poorer condition than when they started their round. You undoubtedly are aware that several previously overweight professionals have made major improvements in their tournament standings after losing weight and getting in shape. All golfers can benefit from better nutrition and proper hydration, however, because these factors play a significant role in energy availability and utilization. Over the course of a golf game, your nutritional preparation can definitely help or hurt your playing performance." For a more indepth look at nutrition and fitness, visit Greg's website. Whatever fitness road you decide to travel, NEVER take medical advice from a non-professional. Remember to ALWAYS check with your personal physician or a physical therapist before starting any new exercise program. They will be able to guide you in the proper exercises for your fitness level. Golf is a game where you yell fore, make six and write down five. I will put you in my appointment book and hope I can expect you back for regular visits. If you have any questions, just click on ask Doc Sal. Click here to return to the Pals.